Home / Entertainment News / DAVID lectures aging SHEILA MWANYIGAH after she revealed her ideal husband, stop acting like a 20 yr old, Unazeeka madam. DAVID lectures aging SHEILA MWANYIGAH after she revealed her ideal husband, stop acting like a 20 yr old, Unazeeka madam. 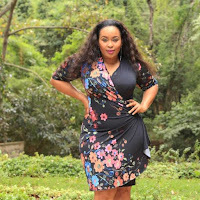 Friday, February 8, 2019 - Curvy TV girl, Sheila Mwanyigah, recently caused a heated debate online after she revealed her ideal husband. The 40 year old TV queen revealed that she has not found the perfect match despite being in several relationships that ended up flopping. "I need a man who is able to make me fall in love with him to death...someone I can't go a day without "
These remarks have rattled a guy called David and this how he lectured the aging media girl who is turning 41 this year. I want a man who can't live without me", these are words of Sheila Mwanyiga, an iconic 40 year old public figure. In fact, she is turning 41 this year, and she is in no hurry to get married anytime soon. Sheila was quoted in an interview speaking of how she has been in three relationships in the past, and in each of those three relationships, she just couldn't figure it out why she wasn't ready for marriage. In the same interview, she continued to say that, " I need a man who is able to make me fall in love with him to death...someone I can't go a day without "
Listen, is this lady really serious with her life? Does she ever want to get married or even have kids? Personally, I think Sheila is all but confused! At her age, she can't afford to be choosy. Time is clearly not on her side. Even though life begins at 40, which may somehow be true, unfortunately for Sheila, that's not the case. All these does not make sense to her at all. To be honest, she should be in a marriage by now! What i fail to understand about Sheila is how she manages to make such utterances (looking for a perfect match) considering her age. The more she stays single, the more she looks stupid! Look, Kenyan men are very choosy when it comes to picking marriage partners. They are very selective when choosing their lifetime partners. Actually, men consider age as one factor that makes them decide whether or not a Lady qualifies to be his lifetime partner. Yeah, I know it hurts but its the truth! Likewise, don't take this the wrong way! And am not in any way writing this post just to inflict more pain on Sheila's misfortunes. Sorry to say this but Sheila is acting like she's 20 years old; which is totally wrong. Does she know the number of young girls who look up to her as their role model? I understand that not all of us were meant to be in a relationship. Of course, nobody would wish to get married at such a later stage in life, but hey! It happens, and there is absolutely nothing you can do about it. But, does that mean you can deliberately stay single forever? Once she hits menopause it will be "game over" for her.